In the title, specify the product or service you are advertising. If possible, add the most important characteristic that will help users make a decision to place an order. Let the user know that they have found exactly what they were looking for. Flights to the moon starting at 79,990 rubles. Your ad may display without a second title, even if you added one. You can use the second header to indicate additional advantages of your product or service, but the ad should still be complete without it. Offer only good until September 1! Describe your offer and what sets it apart from the competition. Specify the parameters that are important for potential customers deciding whether to place an order. Use numbers and wordings that are as concrete as possible. Tour the Reiner Gamma and the alien intelligence database! Book online! Luxury vacation on the edge of the world! Huge selection of tours. Discounts and gifts! Enter a link to the page that describes your advertised product or service. If the user is not able to immediately find the information they read about in your ad, they are more likely to leave your website. If you do not have a website, you can create an ad without a link by filling in your contact information in the Address and phone number field. A display link is a pseudo-address for the page that will display in your ad as an extension of your site address. Use a link that is easy to read and allows the user to understand which page they will land on after clicking your ad. If you have a photo of youer product, upload it. An image makes your ad stand out and helps users understand what you are offering them at a glance. Images in ads only display in ad networks. When your ad is being served, the image may be cropped or proportionally resized to match the ad block settings, so it's best not to use text in images. You can add up to four links that lead to other sections of your site that potential customers may be interested in. For example, Hot deals, Delivery, or Guarantee. Ads that include phone numbers, company hours, and metro stations are more likely to build trust with users and shorten their journey to contacting you. Check to ensure that your ad meets the formatting requirements. An incorrectly formatted ad will get rejected during moderation and have to be edited. Add another ad that advertises the same product or service but with a different text or additional elements. 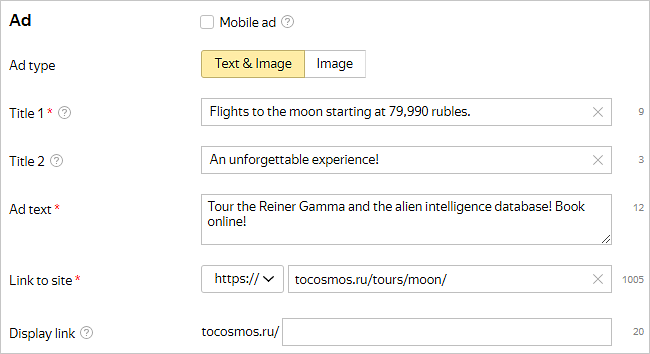 If you have a few ads in your group, Yandex.Direct will automatically choose the most effective one over time and start displaying that one more often.